Anyway, in the midst of me wading through a few busy weeks, Viola’s school had their half-term break. (Culture lesson: In England, the school runs through the end of July, so we have a “half-term” break half-way through the term with a week off in May. It’s very strange to think we still have 6 weeks to go when everyone back in the US is getting out of school for the summer!) We were busy with work and life, so we kinda dropped the ball getting anything formal together. Thankfully, Tyler is a kind man who can read between the lines on my forehead. On Thursday, he booked us a night away for a quick little adventure and a nice break from regular life and, on Friday, we loaded up the car and headed west. Out in the tiniest little corner of the Cotswolds, over by Bradford on Avon, there is a tiny little country property called Widbrook Grange. 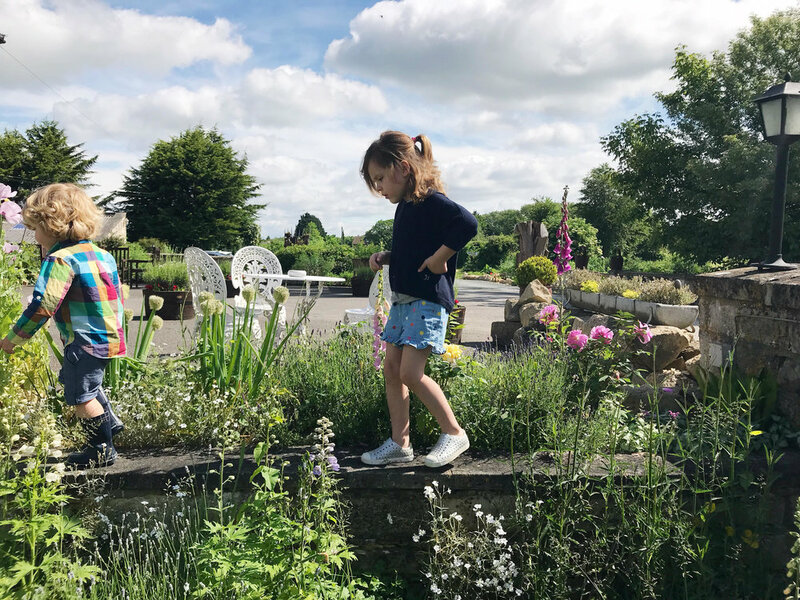 The property is a sweet little country manor that has been renovated into a pretty little escape complete with gardens full of roses, little ponds to throw pebbles in, secret nooks with tables for sunny mornings and unruly paths to explore with little ones. The rooms are nice and comfy- we had a big king-sized bed with a sofa and a baby bed. We all fit into the room easily and had our choice of a bath tub or walk in shower. After we dropped our bags in our room, we spent the early evening exploring the garden trails. They climbed on an old tractor, picked flowers and wandered back to the far end of the property…. until a thunderstorm quickly had us running back to our room. Back in the room, we fed the kids a little 5-course dinner we had picked up from M&S before arriving to the hotel (sandwiches, mango, yoghurt, crisps & a tiny Collin Caterpillar chocolate cake.) Spreading out dinner on a giant towel in a hotel for them is something that they really love…. And I hope that they continue to do so for a long time to come! It definitely took way too long to get them down for bed. Like 1.5 hours. They were jumping and being SO crazy as we tried to get them to sleep… but eventually, we claimed victory and headed out the door for dinner in the restaurant hotel. The staff at check-in gave Tyler a monitor that would work between our room and the dining room… along with a reservation for dinner for whenever we could make it over after bedtime. What a relief! Normally, I am so stressed trying to get kids down and then sneak away for something to eat, but this was so stress-free. And all the kids snoozed through dinner and it was just, well, it was really lovely. The summer sun was glowing even at 9:30, so we got to eat in the sunny remnants of the day and catch up on all the big and small things that seem forgettable in the chaos of everyday life. You know, the non-essential conversations that contain nothing logistical or relay nothing of functional importance. We just had some some of those side conversations with details that flavour so much of why you liked each other in the first place. Talking about what we liked about certain books and movies. Talking about funny things people said to us. Talking about what we were excited to do on our vacation this summer. I needed some of that spice sprinkled in. That Ty spice. Haha! It sure makes a constant intake of daily grind gruel a bit more palatable, doesn’t it? The next morning we ate a sunny breakfast of warm croissants, eggs, bacon and fruit. We ventured out to soak up bit more of the garden life that we were so craving: roly-poly chasing, wall climbing & random singing were all on the agenda. After that, we checked-out and loaded up for lunch in Bradford on Avon. We fell hard for this gorgeous little town- it’s out of a fairy tale. 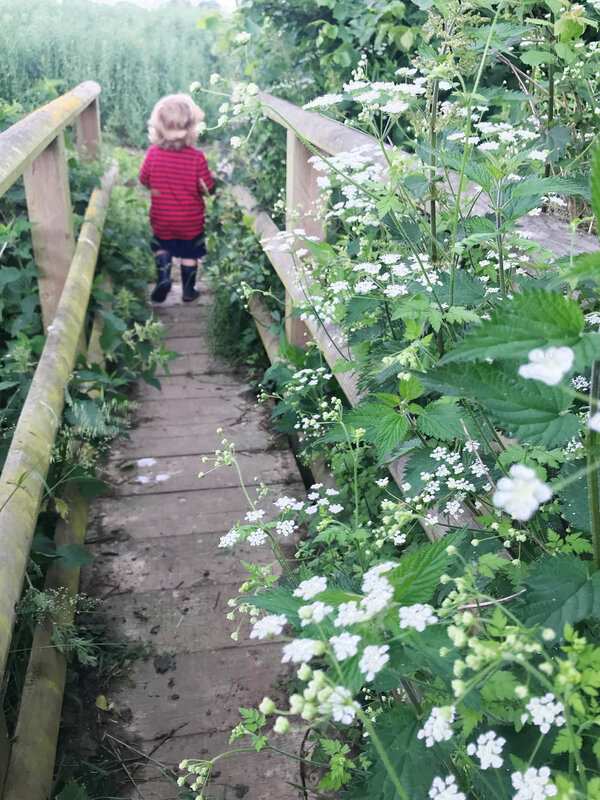 We explored the churches, chased Harrison along the river and sipped Elderflower cordial. This was an easy escape from London. It was two hours from our place there, and is a new spot that we can add to our list for simple getaways that work for the whole family. Next time, we’ll be ready with our swimsuits and hit up their pool! Find more of my favourite places outside of London here on my England travel guide. Or come along on another getaway to the Cotswolds via YouTube!